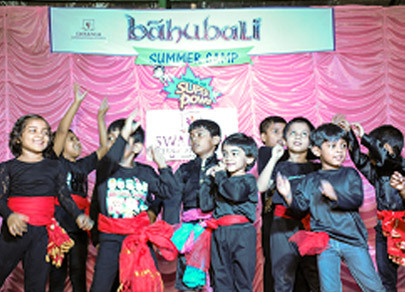 We offer 4 years exciting learning programmes for children between ages 2 to 6. 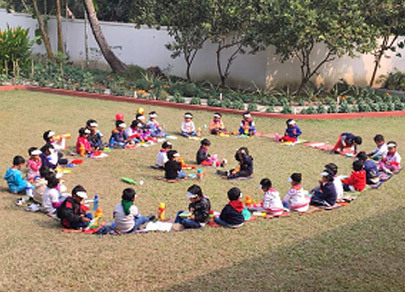 Our methodology is a combination of the Montessori method and the Kindergarten method. The Montessori approach is a kinesthetic educational model based on learning through discovery; learning is highly individualized. This model directs children to improve concentration, self-motivation and self-discipline. The child's multiple senses are employed and the child is allowed to pursue his interests without interruption. 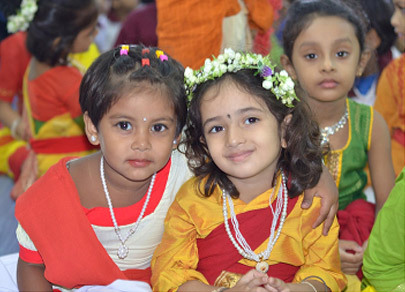 The school also nurtures the tabula rasa within your child, teaching them moral values, Indian culture, hygiene and etiquette. The kindergarten approach is more of a shared experience; the kids enter together as a group and learn together as a group. Children are involved in their own learning and link new ideas to their prior knowledge and share what they have learned. 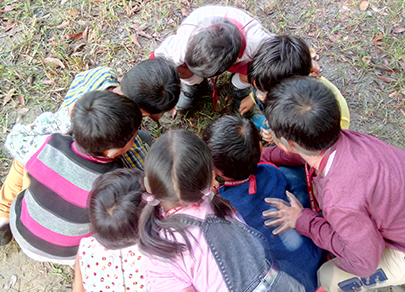 Since children learn best through the playful interaction of objects and people, we promote children's natural inquisitiveness in an environment that allows them to learn and progress at their own pace. 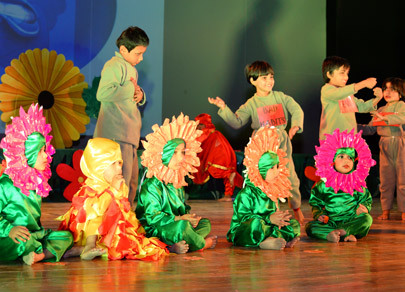 We offer a well-researched curriculum that invites the children to explore their world in multiple ways. Sensory stimulation is rich and triggers investigations. Curiosity and interest set the tone for self paced learning. 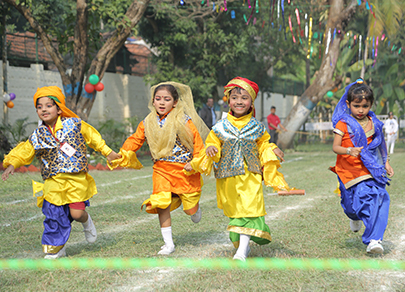 Concepts are taught through activities, songs and games and a variety of hands-on experiences. 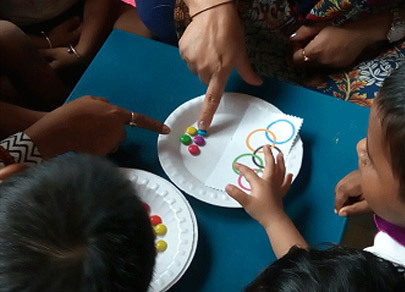 Building relationships through play, pair and share, participation in Large Group Activities like: Birthday Parties, Festivals, Observance of Special Days and Medium Group Activities like: Table Manners, Singing and Dance. Exploring objects using the five senses, Building, Role Play, Mixing colors, Scribbling across a black board, Art and craft activities, Painting and Shaping objects are a great way to encourage new way of thinking, creating and communicating with images as well as words. Music and movement help the child to have longer attention spans, which helps to improve the listening abilities and the development of language and vocabulary skills. Kids are never too young to start learning math skills. Our math program allows hands on exploration, active investigation and the use of manipulation. It includes counting, sorting, and working with puzzles that are important first steps to a solid learning. Reading is the foundation of all learning. We have a range of exciting activities to help children acquire pre-reading and reading skills, which include Letter Recognition & Sounds, Literature Based and Language Arts Activities, Printing Letters, Names Beginning, and Blending/Sounding-out Skills. 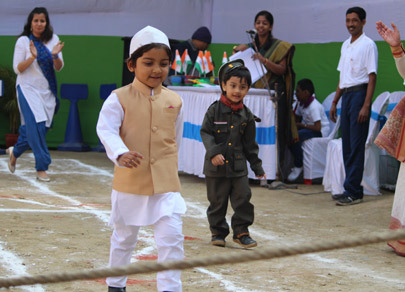 Since children learn best through direct experiences, visits to Parks, Departmental Stores, Fire Station, Post Office and such are planned regularly. Lil Learners for ages two and above: Children stepping into school are introduced to individual and group activities that are thoughtfully crafted to aid expression and foster independence. Dynamic Discoverer for ages three and above: Our curriculum covers a diverse range of topics, offering your child a window of opportunities to learn and grow, while inspiring creativity as they understand more about the world around them. Excited Explorer for ages four and above: We ensure children learn to the best of their potential and will be ready for the advanced concepts that they have to learn in later grades. Fantastic Flyers for ages five and above: Children develop a strong foundation in a variety of subjects that prepare them for formal schooling.